Perfect for carving turkeys and roasts, the Wusthof Classic 2 piece carving set is a great addition to your cutlery collection as well as an ideal gift for the holiday season. The 8 inch carving knife is the perfect length for carving turkey or other poultry and it has a hollow ground edge that improves slicing by keeping food from sticking to the blade. The super-sharp blade is made from long-lasting German stainless steel and is sharpened with Wusthof's PEtec system, which greatly increases edge life and overall sharpness. 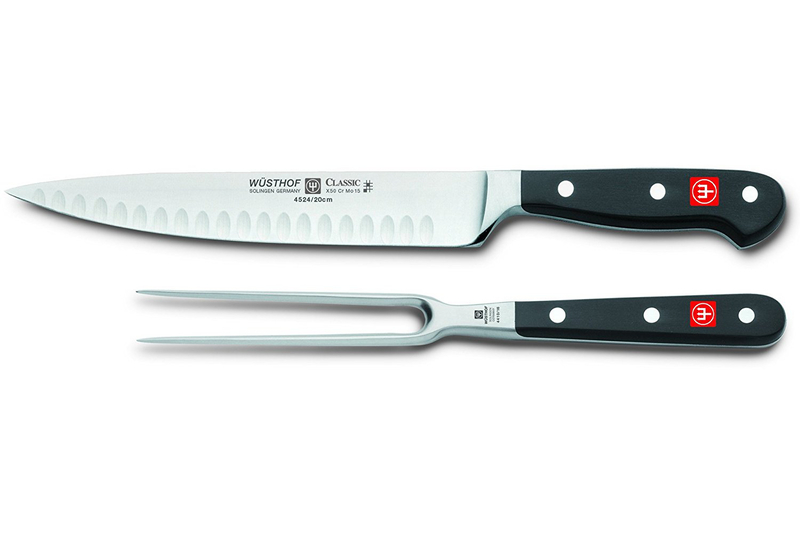 This Wusthof 2-piece carving set also includes a high-quality, forged carving fork for holding and serving slices. Made in Solingen, Germany, Wusthof cutlery is guaranteed for life with proper care and use. You can see the impressive German engineering in this forged cutlery.